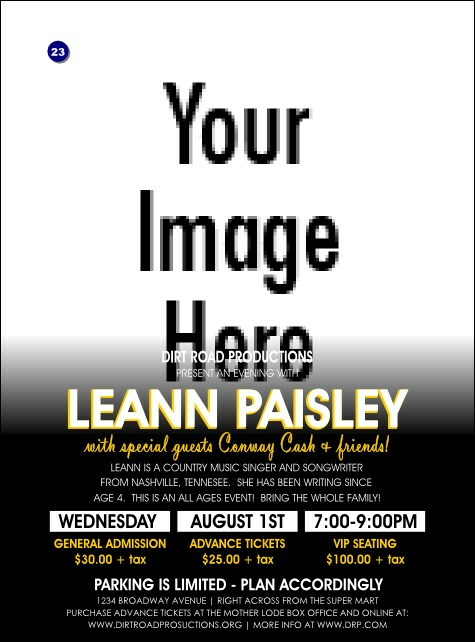 Draw fans to your show like bees to honey with the Your Photo Concert (Yellow) Flyer! This template puts your performer or band front and center via a gigantic custom image upload spot that takes up a large part of the background. Laid atop a black background at the bottom, your concert’s information pops in white and yellow. Measurements are 8.49" x 11.46"
Promote your event with custom printed flyers! Browse lots of eye-catching templates on TicketPrinting.com.